Hali Bernstein Saylor/Boulder City Review Rotary Club of Boulder City recognized the benefactors of its bike rehabilitation program, Maureen and Barry Thibodeau, far left, during their meeting Aug. 29. Members, from left at center, Tom Riggs, Larry Archuleta and President Sandy Johnson presented the Thibodeaus with a plaque and bouquet of flowers for giving them the contacts to obtain bicycles in need of repair that can be donated to members of the community. Rotary Club of Boulder City recognized the benefactors of its bike rehabilitation program, Maureen and Barry Thibodeau, far left, during their meeting Aug. 29. 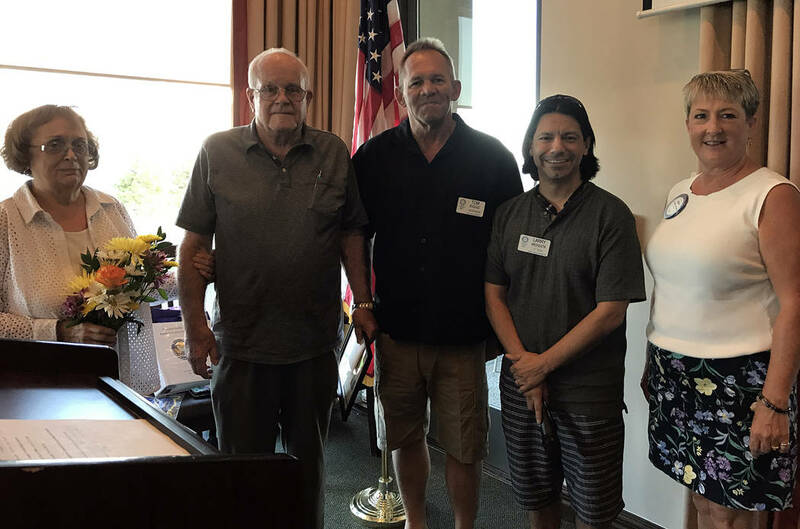 Members, from left at center, Tom Riggs, Larry Archuleta and President Sandy Johnson presented the Thibodeaus with a plaque and bouquet of flowers for giving them the contacts to obtain bicycles in need of repair that can be donated to members of the community.